(MP082). Alma Claude Burlton Cull (1880-1931). Watercolour signed and dated 1928..
Standard size: 21 x 15 ins (53 x 38 cms) approx. 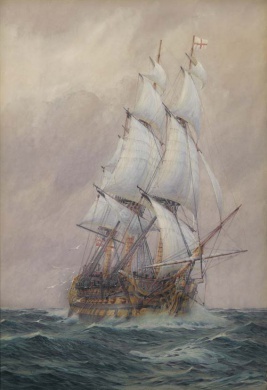 This beautiful watercolour is a reminder of how impressive these wooden walls were when actually at sea with all sail crammed on: they are relatively poor things when caged in a dry dock and with all sails furled. Painted three years before his death in 1931, the 48 year old Cull was possibly joining the clamour of artists who were busy painting VICTORY: after 6 years in dry dock and considerable restoration she was, we are told, starting to look her old self again. As always, Cull’s seas and skies add greatly to the effect of this watercolour and the detail of upper deck activities is bonus.